At the eighth annual Tom and Marla Corts Distinguished Author Series, Eric Motley delivered a powerful message to more than 750 members of the Samford University, Birmingham and Montgomery communities, including 83 students from Holy Family Cristo Rey High School and Restoration Academy. The series is presented by Samford University’s Orlean Beeson School of Education. The 1996 Samford graduate discussed his recently released memoir Madison Park: A Place of Hope. The memoir shares the inspirational story of his upbringing in the Madison Park community of Montgomery, Alabama, and the amazing power of gratitude, generosity, grace, and faith in God and each other. This is the first time that an alumnus was selected as a Corts Distinguished Author. 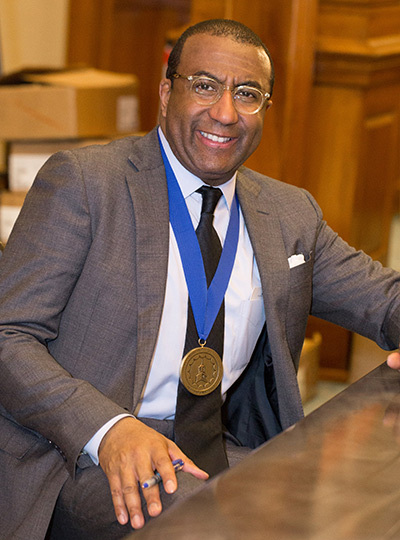 Motley reflected on his journey from Madison Park to Samford University, his hope, aspiration and desire to be the first from his family to attend college and his first encounter with former Samford President Thomas Corts in the Leslie S. Wright Center in 1991. In 1880, a group of freed slaves set out to live into the promise of life liberty and the pursuit of happiness. Within two years, the group worked collectively to purchase May Plantation and establish Madison Park. Madison Park was the first community established by a group of freed slaves in Alabama. “The founding members of Madison Park made a promise to surrender their individual ambitions for the good of a collective cause. The cause of community,” said Motley. “I know the details of this story because my grandfather’s grandfather, John Westley Motley, was one of the founding members.” The initial promise of community stood firm many years later. According to Motley, everyone in Madison Park was poor but no one knew they were poor because they were immeasurably rich in principles, hope and collective aspirations. In the spirit of community, when Motley’s grandparents were asked by a neighbor if they would adopt one of their fourteen children, they accepted. At the age of 19, the child they adopted gave birth to a, “bundle of unformed possibility,” Eric L. Motley. Motley reflected on three moments in his life where the trajectory of his story was dramatically changed by the authenticity of community in Madison Park. There was the time in first grade where he was demoted from the rabbit reading group to turtle. His grandmother made one phone call and a family friend recruited three fellow retired teachers to tutor Motley. Other community members dropped books on his grandparents’ front porch. With the help of his community, Motley was resurrected to rabbit status. One summer, Motley was selected to participate in a YMCA program in the city. His grandfather’s friend questioned how they would afford the gas but Motley’s grandfather was persistent that it was worth the cost. Every Tuesday and Thursday morning when Motley and his grandfather would start the car, the fuel gage would be set to full. Fifteen years later Motley would learn that his grandfather’s dear friend, who was poor in materials but rich in generosity, would push his car up the Motley driveway in the dead of night and funnel gas into the Motley car. The final story Motley shared on the importance of community, depicted the scene of the night before he left to attend the University of St. Andrews in Scotland. He described being heavy hearted and worried about leaving his elderly grandparents who had made so many sacrifices for him, but as night fell his grandmother led him outside where he remembers what, “felt like the entire community of Madison Park assembled in the yard of 34 Motley drive,” said Motley. He was assured that the community would continue to stand with he and his family. At the conclusion of the evening, Drayton Nabers Jr., director of Samford’s Francis Marlin Mann Center for Ethics and Leadership, presented Motley with the Mann Metal. The Mann Metal is one of the highest levels of distinction awarded by Samford. The Tom and Marla Corts Distinguished Authors Series is named for Samford’s 17th president and his wife. In 2011, the series was launched to recognize their invaluable leadership to Samford University, the community and the cause of literacy. Proceeds from the 2018 Tom and Marla Corts Distinguished Author Series benefit the Eric L. Motley scholarship which is awarded to Samford University students who have demonstrated financial need and who exemplify outstanding leadership qualities. Sponsors for this year’s series included The Thomas E. and Marla Haas Corts Endowment, The Percy Cook Ratliff Endowment, Dr. and Mrs. Sigurd Bryan, Mr. and Mrs. Boyd Christenberry, Mr. Jay I. Kislak, Davis Architects, Skin Diagnostics Group PC, and Mr. and Mrs. Hobart Grooms Jr.
Over the years, the Distinguished Authors Series has brought a diverse group of authors to Samford. Previous guests include Parker J. Palmer, Laura Bush, Wes Moore, Wendell Berry and Greg Mortenson. If you were unable to attend the lecture please click here to view the official recording of the 2018 Tom and Marla Corts Distinguished Author Series.